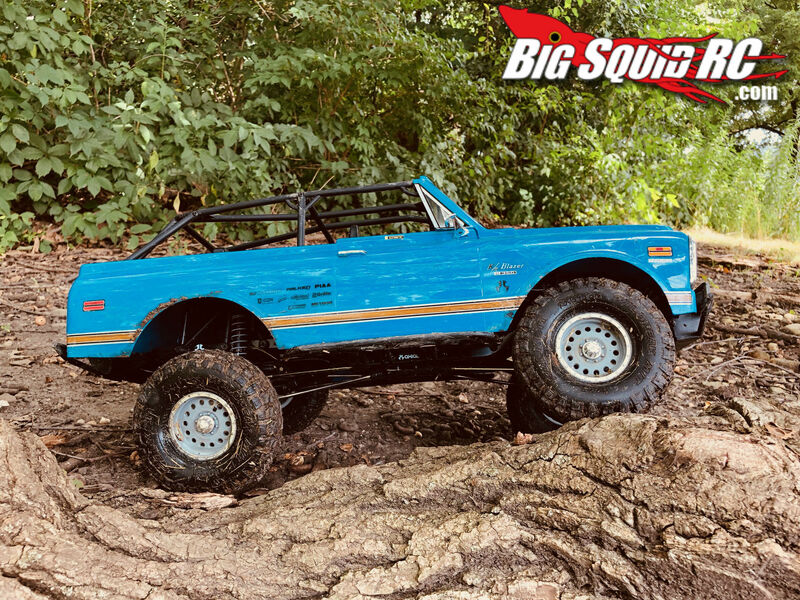 AXIAL RACING SCX 10 II 1969 CHEVORLET BLAZER REVIEW « Big Squid RC – RC Car and Truck News, Reviews, Videos, and More! 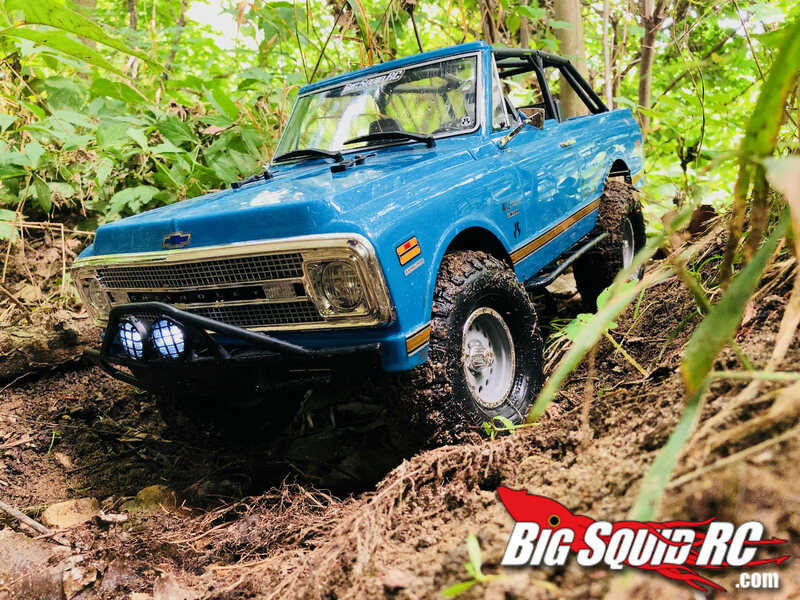 This is what Chevy fans have been waiting for, the Axial SCX10 II 1969 Chevrolet Blazer. 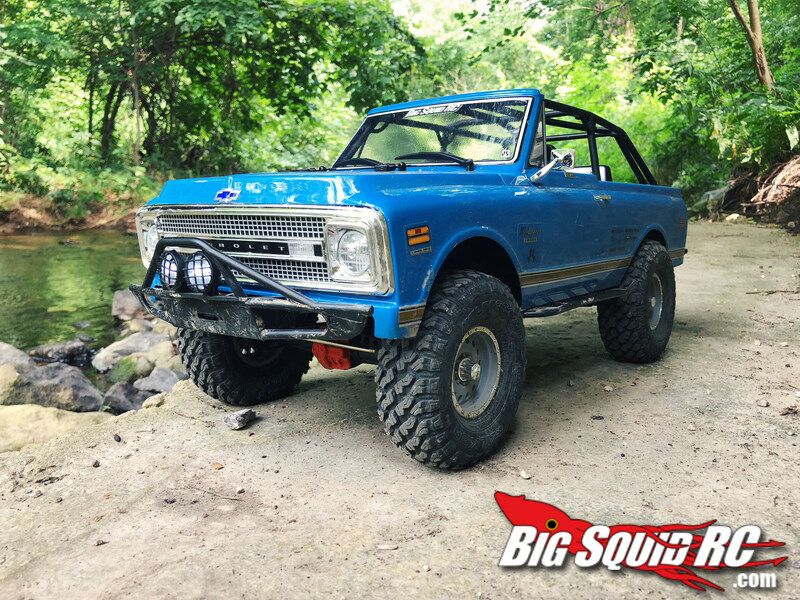 Hitting a scale home run with the beautifully detailed 1969 Chevrolet Blazer body. Not only does the 1969 Blazer look fantastic but preforms like the find tuned machine it was meant to be. 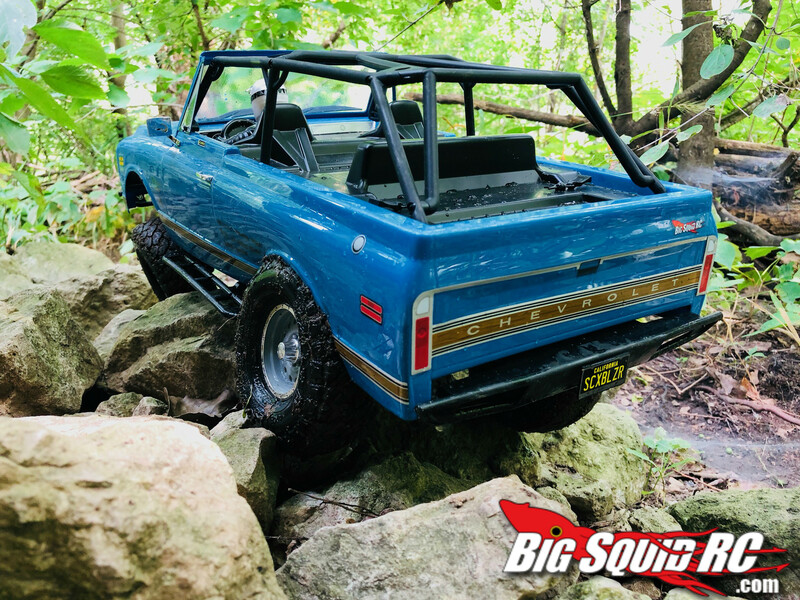 We put the Axial 1969 Blazer through tough and extreme punishment. So lets dig into the review and find out how well it handled the Big Squid RC torture chamber! Primary Competition: Axial Racing is certainly one of the big dogs in the Crawler world. But, with that being said, they still have competition like RC4WD, Traxxas, RedCat, Carisma and Cross RC. Jumping: you might be able to get a few inches of air time if your lucky. The 35 Turn motor does not really deliver the speed you need to go air-born. pavement to reach the next trail so be it. Grass: The Axial Blazer had no problem mowing down a path threw some tall grass. 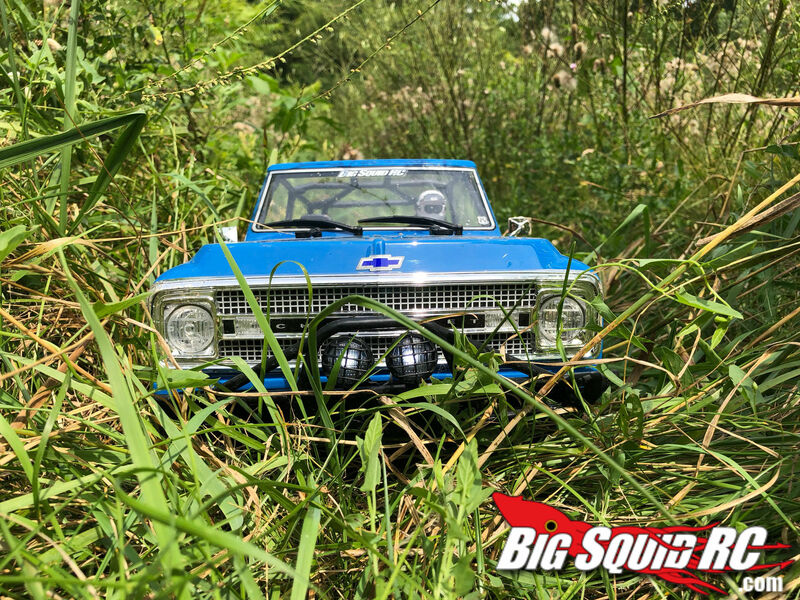 Other then the normal issues you have when driving threw tall grass like thick blades of grass getting wrapped around the drive shaft or axles. But that is going to happen no matter what rig you use. Tires: The scale 1.9 Falken Wild Peak M/T Tire have a nice soft compound. These tires seem to just grab rocks as if they had thumbs. And the Method Hole Wheels make a fantastic scale combination. Just be sure to give your tires a good squeezing after running them in the water. Power: The Axial 35T motor is a champ! While lacking in the speed department it makes up for it with top notch torque. The ESC is an AE-5L makes it extremely easy to switch it from lipo mode to NiMh. And Just as easy to change the drag break with the jumpers. Also, the LED duel built-in outputs are a nicetouch. Having the LED outputs built-in keep your rig from looking like rat nest of wires. Its waterproof design lets you take it for a swim without having to worry about frying the ESC. Radio: Axials Tactic TTX3000 3-Channel SLT Radio is one of those remotes that just feels good in your hands. On top of having your regular adjustment knobs like ST. D/R, TH. Trim and ST. Trim. It features a programmable 3rd channel. Saving you from having to buy a separate remote if you want to control a winch, lights or even Two speed shifting. Broken parts: Ok we got to the point where we were trying to break the Axial blazer. Even went as far as handing off the remote to my 2 year old son. The only part we had break was one of the side mirrors. After all the punishment we put the Axial Blazer through a little broken side mirror is nothing to cry about. Best Mod: As far as mods go like all RTRs the servo is always the weakest link. Now its not bad enough where you need to swap it out right out of the box. But we would recommend replacing it once it eventually breaks with a more powerful servo. Time to bash. B.. Everything out of the box was good to go, we didn’t encounter any problems getting things rolling. Workability: B. Axial Racing likes to keep it simple when it comes to the mechanical side. Making sure the new guy to the hobby doesn’t get discouraged when a part breaks and needs replacing. Car Show Rating. A. The only reason the Axial Blazer didn’t get a A+ is due to the interior. They really should have sunk it down another ¼ inch. 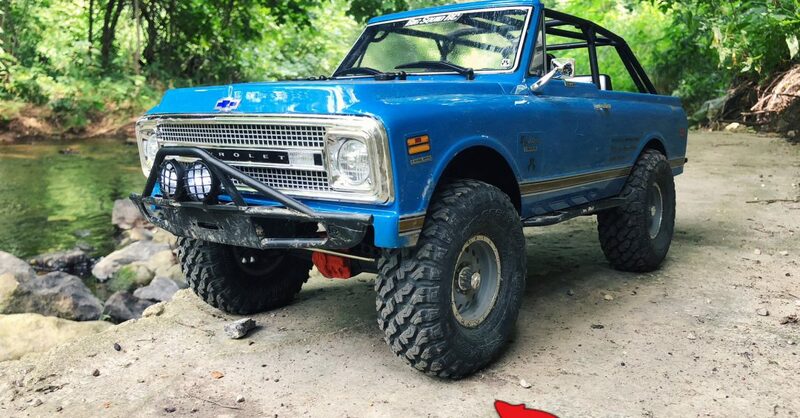 Other than that the 1969 Chevrolet Blazer is the best looking rig Axial has come out with! Bash-A-Bility. B. 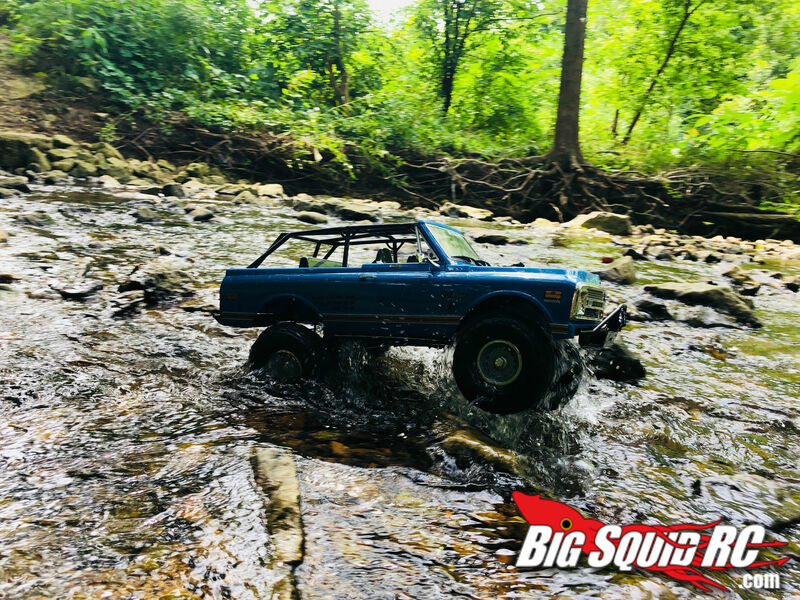 From the rocky streams in Illinois to the muddy banks of the Mississippi River the Axial Blazer held together. Hey, it’s a crawler not a basher. But I will say it is one tough cookie. Even after sending it off a 7ft cliff, the Axial Blazer held up great. If a 2 year old kid who only knows how to use the trigger couldn’t break it than it’s worth its weight in gold to me. Fun Factor. A. The Blazer is a lot of fun to drive. If you have had any experience with Axial Racing’s vehicles you already know they make some fun rigs. 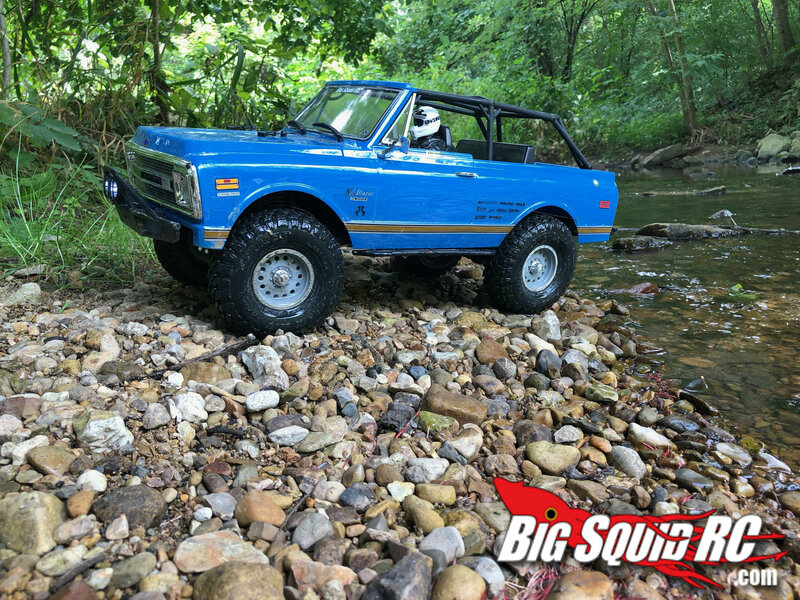 I personally love the scale side of the hobby and the Axial Blazer feeds my Scalin’ lust. Not only does it look great in photo’s but it can crawl with the best of them. Handling: A. It’s nice to open a brand new rig and be able to hit the trails right away. If we had to describe the Blazer only using one word it would be “smooth”. No jittering of the servo or wobble from the tires just smooth. The adjustable coilover shocks are fantastic for making adjustments on the fly. Just by adjusting the dampening rate on the shocks can make the Axial Blazer ready to tame the most rugged terrain. Value. B. Some may think the price is a little high but I can assure you for a licensed body and all the bells and whistles that come along with the Axial Blazer $419.99 is a good deal. Parts Availability. A. You will have no problem finding parts at your local hobby shop or online. And on a plus side you get a big bag of Parts trees with the Axial Blazer in the box. And those are great to have because sometimes you can’t get to the hobby some quick enough! BigSquid Rating: B+. Not too many RTR rigs can get you a Scalin’ rating of “8” right out the box. 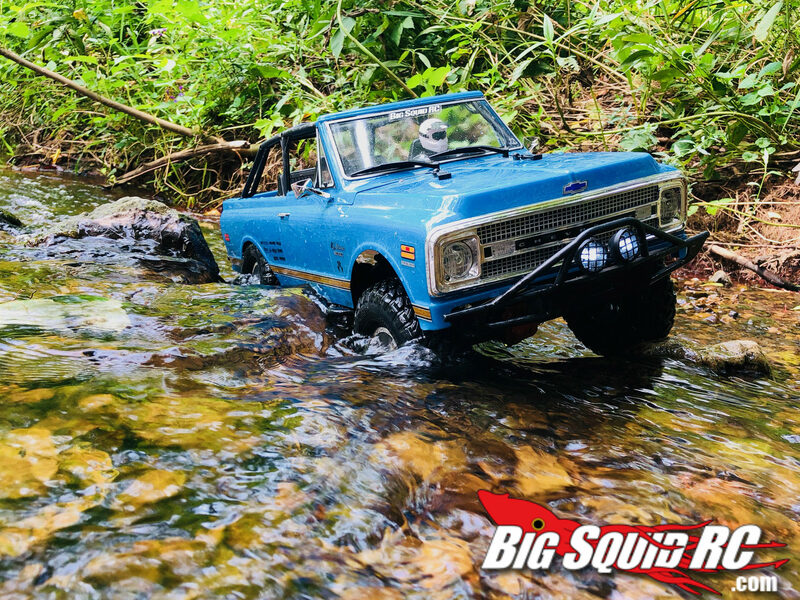 But the Axial Racing SCX10 II 1969 Chevrolet Blazer will do just that. With any rig that looks this good it is hard at first to take it out on the trails but like they say “The first scratch is the hardest”. After that it’s all beauty marks. Aside from looking great the Axial Blazer preforms extremely well. 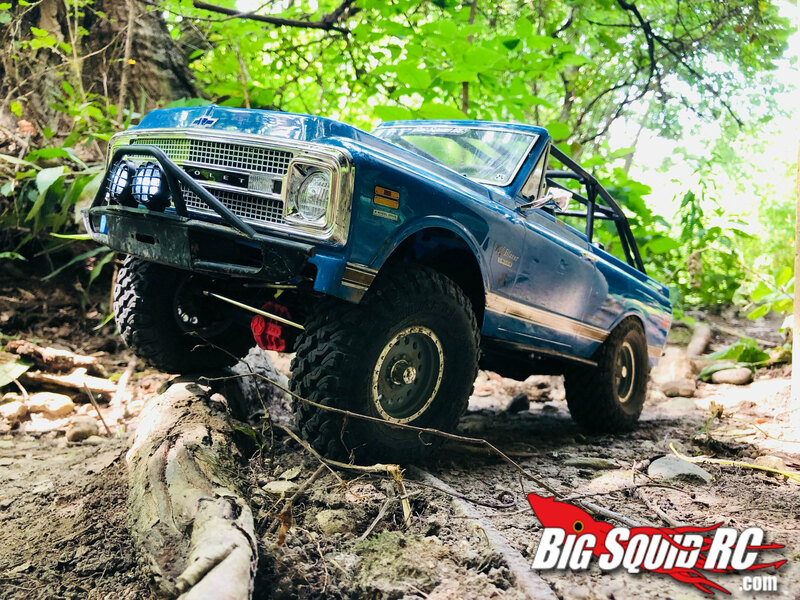 Whether you are hitting up some scale trails or doing some rock crawling, the Blazer gets the job done plan and simple. 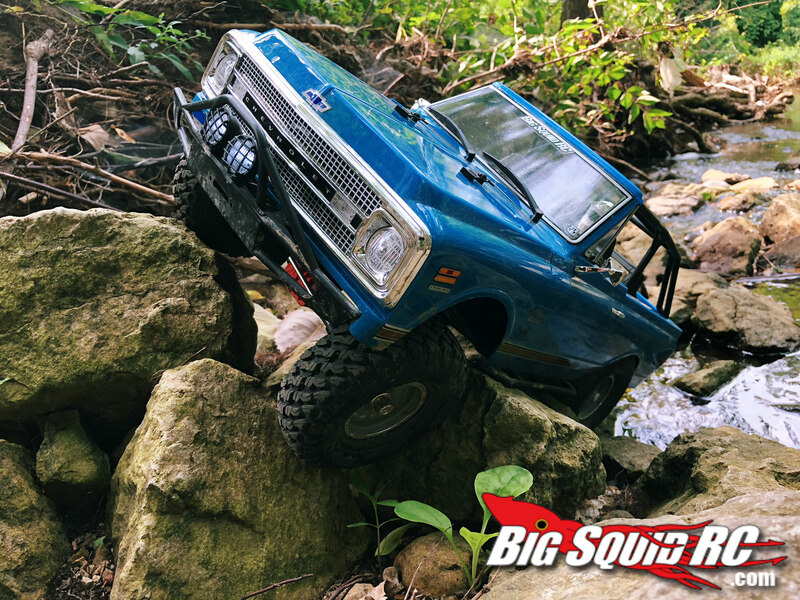 So, if you have been thinking about picking up the Axial Blazer we would definitely recommend it.